GREEN BAY–Richard Rodgers is a tight end loaded with upside, and he’ll have a chance to develop his talents in an offense famous for developing tight ends. Rodgers, 6-4, 257, made a position switch from tight end to wide receiver while at California. He made the move seamlessly enough to vault into the third round of the NFL draft, but as a tight end. Rodgers was selected by the Packers on Thursday night with the 98th overall pick, the Packers’ second of two third-round picks and the team’s final pick of the second day of the draft. “His father is the special teams coach of the Carolina Panthers. Played wide receiver at 245 pounds last season. Was a 270-pound blocking tight end the year before. Shows flashes but he’s green as grass. Has skill but needs time,” packers.com draft analyst Tony Pauline said of Rodgers. Packers.com has provided a full report on the third round. GREEN BAY–The Packers addressed an ongoing need for defensive linemen by selecting Khyri Thornton of Southern Mississippi with their first of two third-round draft choices on Thursday. Thornton, 6-3, 304, was selected with the 85th overall pick. Thornton is a defensive tackle that will likely play defensive end in the Packers’ 3-4 defensive scheme. “Classic three-technique tackle. Quick, explosive. Probably a two-gap end,” packers.com draft analyst Tony Pauline said of Thornton. GREEN BAY–The Packers turned their attention to offense and the loss of James Jones in free agency by selecting Fresno State wide receiver Davante Adams with the 53rd pick of the 2014 NFL draft on Friday. Adams, 6-1, 212, is the Packers’ first pick of day two of the draft, after having selected safety Ha Ha Clinton-Dix in the first round on Thursday. Tight ends Troy Niklas and Jace Amaro came off the board within the previous four picks, and center Weston Richburg was selected 43rd overall by the Giants. Tight end, center and inside linebacker are considered to be positions of need for the Packers, but so were safety and wide receiver. Adams ran a 4.56 40 at the combine. GREEN BAY–The fans’ pick is the Packers’ pick. Safety Ha Ha Clinton-Dix is the Packers’ first pick of the 2014 NFL draft. The Alabama star was selected with the No. 21 overall choice. The pick will no doubt be met with favor among Packers fans who began a campaign to draft Clinton-Dix shortly after last season ended with a Packers safety failing to have intercepted a pass. Clinton-Dix, 6-1, 208, is the second safety selected in this draft. Louisville’s Calvin Pryor was chosen 18th overall by the Jets. “Smart, instinctive, good anticipation. More of a true centerfielder,” packers.com draft analyst Tony Pauline said of Clinton-Dix. Pro Football Hall of Famer and former Packers receiving great James Lofton will announce the Packers’ second-round draft pick at Radio City Music Hall in New York City on Friday, May 9. This marks the fourth straight year the NFL has had alumni players announce picks at the draft. 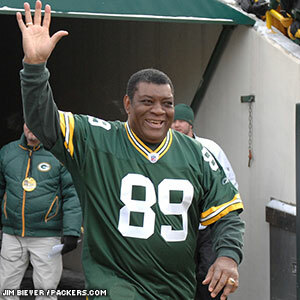 Last year’s Green Bay alum was Dave Robinson, who was inducted into the Pro Football Hall of Fame a few months later. Around the NFC North, the alumni announcing second-round picks will be as follows: LB Mike Singletary for the Chicago Bears, WR Herman Moore for the Detroit Lions and S Joey Browner for the Minnesota Vikings. The Packers are in line for a compensatory draft pick or two, which could be announced as soon as today at the NFL’s annual meeting in Orlando. Teams are awarded compensatory draft picks if they experience a net loss in unrestricted free agency the prior year. The Packers lost WR Greg Jennings (Vikings) and LB Erik Walden (Colts) while signing no unrestricted free agents from other teams. Compensatory picks are awarded from the end of the third through the seventh rounds and cannot be traded. The league meeting is taking place now through Wednesday. The announcement of compensatory picks could come as soon as late this afternoon. Last year, the Packers received a compensatory pick in the fifth round and used it to select DE Josh Boyd. Other compensatory picks from recent drafts include DE Mike Daniels (fourth round, 2012), CB Davon House (fourth round, 2011) and G Josh Sitton (fourth round, 2008). The Packers were awarded two compensatory picks, in the third and fifth rounds. For the full story, click here. As had been speculated for weeks, the 2014 NFL Draft is being moved from late April to May. It will be held May 8-10 in its usual location, Radio City Music Hall in New York City. The NFL made the announcement on Tuesday but also stated that no decision has been made on the dates of the draft in 2015 and beyond. The league also announced that there would be no significant changes in the dates of other major offseason events, including the scouting combine (Feb. 18-25, 2014), the start of the new league year and free agency period (March 11, 2014) and the league’s annual meeting (March 23-26, 2014, in Orlando, Fla.). The newest Green Bay Packers player to enter the Pro Football Hall of Fame, Dave Robinson is scheduled to announce the Packers’ second- and third-round draft picks at the 2013 NFL Draft on Friday, April 26. The NFL has made it a tradition in recent years to have alumni of all of the league’s teams take the podium during the second day of the draft to announce his former team’s selections. LeRoy Butler and Jim Taylor have done the honors for the Packers in the past. A linebacker in the Vince Lombardi era, Robinson was a senior committee nominee for the Hall of Fame this year and received the necessary votes for induction. He’ll be inducted at the usual ceremony in Canton, Ohio, this summer. Robinson is the 11th Packers player from the Lombardi era to make the Hall of Fame, and the first since Henry Jordan in 1995. The last Packers player to be inducted was the late Reggie White in 2006.